Graz ( [ˈɡʁaːt͡s]) is the capital of Styria and the second-largest city in Austria after Vienna. On 1 January 2017, it had a population of 320,587 (of which 286,686 had principal residence status). In 2015, the population of the Graz larger urban zone who had principal residence status stood at 613,286. Graz has a long tradition as seat of universities: its six universities have more than 44,000 students. Its historic centre is one of the best-preserved city centres in Central Europe. For centuries, Graz was more important to Slovenes, both politically and culturally, than the capital of Slovenia, Ljubljana, and it remains influential to this day. In 1999, Graz was added to the UNESCO list of World Cultural Heritage Sites, and the site was extended in 2010 with Eggenberg Palace (German: Schloss Eggenberg). Graz was sole Cultural Capital of Europe for 2003 and got the title of a City of Culinary Delights in 2008. The name of the city, Graz, formerly spelled Gratz, most likely stems from the Slavic gradec, "small castle". Some archaeological finds point to the erection of a small castle by Alpine Slavic people, which over time became a heavily defended fortification. In literary Slovene, gradec still means "small castle", forming a hypocoristic derivative of Proto-West-South Slavic *gradьcъ, whichs descends via liquid metathesis from Common Slavic *gardьcъ and via the Slavic third palatalisation from Proto-Slavic *gardiku, originally denoting "small town, settlement". The name thus follows the common South Slavic pattern for naming settlements as grad. The German name 'Graz' first appears in records in 1128. Graz is situated on the Mur River in the southeast of Austria. It is about 200 km (120 mi) southwest of Vienna. The nearest larger urban centre is Maribor in Slovenia which is about 50 km (31 mi) away. Graz is the capital and largest city in Styria, a green and heavily forested area. The oldest settlement on the ground of the modern city of Graz dates back to the Copper Age. However, no historical continuity exists of a settlement before the Middle Ages. During the 12th century, dukes under Babenberg rule made the town into an important commercial center. Later, Graz came under the rule of the Habsburgs, and in 1281, gained special privileges from King Rudolph I. In the 14th century, Graz became the city of residence of the Inner Austrian line of the Habsburgs. The royalty lived in the Schlossberg castle and from there ruled Styria, Carinthia, most of today's Slovenia, and parts of Italy (Carniola, Gorizia and Gradisca, Trieste). In the 16th century, the city's design and planning were primarily controlled by Italian Renaissance architects and artists. One of the most famous buildings built in this style is the Landhaus, designed by Domenico dell'Allio, and used by the local rulers as a governmental headquarters. Karl-Franzens-Universität, also called the University of Graz, is the city's oldest university, founded in 1585 by Archduke Karl II. For most of its existence, it was controlled by the Catholic church, and was closed in 1782 by Joseph II in an attempt to gain state control over educational institutions. Joseph II transformed it into a lyceum where civil servants and medical personnel were trained. In 1827 it was re-instituted as a university by Emperor Franz I, thus gaining the name 'Karl-Franzens Universität,' meaning 'Charles-Francis University.' Over 30,000 students currently study at this university. The astronomer Johannes Kepler lived in Graz for a short period. There, he worked as a math teacher and was a professor of mathematics at the University of Graz, but still found time to study astronomy. He left Graz to go to Prague when Lutherans were banned from the city. Ludwig Boltzmann was Professor for Mathematical Physics from 1869 to 1890. During that time, Nikola Tesla studied electrical engineering at the Polytechnic in 1875. Nobel Laureate Otto Loewi taught at the University of Graz from 1909 until 1938. Ivo Andric, the 1961 Nobel Prize for Literature Laureate obtained his doctorate at the University of Graz. Erwin Schrödinger was briefly chancellor of the University of Graz in 1936. Graz lies in Styria, or Steiermark in German. Mark is an old German word indicating a large area of land used as a defensive border, in which the peasantry is taught how to organize and fight in the case of an invasion. With a strategic location at the head of the open and fertile Mur valley, Graz was often assaulted (unsuccessfully), e.g. by the Hungarians under Matthias Corvinus in 1481, and by the Ottoman Turks in 1529 and 1532. Apart from the Riegersburg Castle, the Schlossberg was the only fortification in the region that never fell to the Ottoman Turks. Graz is home to the region's provincial armory, which is the world's largest historical collection of late medieval and Renaissance weaponry. It has been preserved since 1551, and displays over 30,000 items. From the earlier part of the 15th century, Graz was the residence of the younger branch of the Habsburgs, which succeeded to the imperial throne in 1619 in the person of Emperor Ferdinand II, who moved the capital to Vienna. New fortifications were built on the Schlossberg at the end of the 16th century. Napoleon's army occupied Graz in 1797. In 1809, the city withstood another assault by the French army. During this attack, the commanding officer in the fortress was ordered to defend it with about 900 men against Napoleon's army of about 3,000. He successfully defended the Schlossberg against eight attacks, but they were forced to give up after the Grande Armée occupied Vienna and the Emperor ordered to surrender. Following the defeat of Austria by Napoleonic forces at the Battle of Wagram in 1809, the fortifications were demolished using explosives, as stipulated in the Peace of Schönbrunn of the same year. The belltower and the civic clock tower, often used as the symbol of Graz, were spared after the people of Graz paid a ransom for their preservation. Archduke Karl II of Inner Austria had 20,000 Protestant books burned in the square of what is now a mental hospital, and succeeded in returning Styria to the authority of the Holy See. Archduke Franz Ferdinand was born in Graz, in what is now the Stadtmuseum (city museum). The more recent population figures do not give the whole picture as only people with principal residence status are counted and people with secondary residence status are not. Most of the people with secondary residence status in Graz are students. At the end of 2006 there were 37,624 people with secondary residence status in Graz. Due to its position southeast of the Alps, Graz is shielded from the prevailing westerly winds that bring weather fronts in from the North Atlantic to northwestern and central Europe. The weather in Graz is thus influenced by the Mediterranean, and it has more hours of sunshine per year than Vienna or Salzburg and also less wind or rain. Graz lies in a basin that is only open to the south, causing the climate to be warmer than would be expected at that latitude. Plants are found in Graz that normally grow much further south. Politically, culturally, scientifically and religiously, Graz was an important centre for all Slovenes, especially from the establishment of the University of Graz in 1586 until the establishment of University of Ljubljana in 1919. In 1574, the first Slovene Catholic book was published in Graz, and in 1592, Hieronymus Megiser published in Graz the book Dictionarium quatuor linguarum, the first multilingual dictionary of Slovene. The Styrian Slovenes did not consider Graz a German city, but their own, a place to study while living at their relatives' homes and to fulfill one's career ambitions. The student associations in Graz were a crucible of the Slovene identity and the Slovene students in Graz were more nationally aware than some others. This led to fierce anti-Slovene efforts of German nationalists in Graz before and during World War II. Many Slovenian Styrians study there. Slovenes are among the professors at the Institute for Jazz in Graz. Numerous Slovenes have found employment there, while being formally unemployed in Slovenia. For the Slovene culture, Graz remains permanently important due to its university and the Universalmuseum Joanneum archives containing numerous documents from the Slovenian Styria. A symposium on the relation of Graz and the Slovenes was held in Graz in 2010, at the occasion of the 200th anniversary of the establishment of the first and oldest chair of Slovene. It was established at the Lyzeum of Graz in July 1811 on the initiative of Janez Nepomuk Primic. A collection of lectures on the topic was published. The Slovenian Post commemorated the anniversary with a stamp. For Graz's stint as Cultural Capital of Europe a few new public buildings were erected in the city. 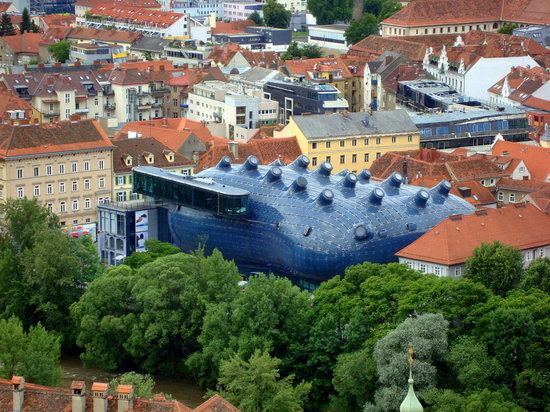 The most famous is the Kunsthaus (house of modern art) designed by Peter Cook and Colin Fournier, a museum constructed next to the river Mur, and the Murinsel (island in the Mur), an island made of steel, situated in the river. It was designed by the American architect Vito Acconci and contains a café, an open-air theatre and a playground. The old town was added to the UNESCO World Heritage List in 1999 due to the harmonious co-existence of typical buildings from different epochs and in different architectural styles. Situated in a cultural borderland between Central Europe, Italy and the Balkan States, Graz absorbed various influences from the neighbouring regions and thus received its exceptional townscape. Today the old town consists of over 1000 buildings, their age ranging from Gothic to Contemporary. Schlossberg, hill dominating the old town (475 m (1,558.40 ft) high), site of demolished fortress, with views over Graz. Uhrturm clocktower, symbol of Graz, on the top of Schlossberg. Neue Galerie. Museum of art. Schlossbergbahn, a funicular railway up the Schlossberg. The Landhaus, the building where the federal state parliament of Styria resides, a palace in Lombardic style. It is one of the most important examples of Renaissance architecture in Austria and was built by the Italian architect Domenico dell'Allio between 1557 and 1565. The Landeszeughaus, armoury, the largest of its kind in the world. The Opernhaus, the principal venue for opera, ballet, and operetta performances. It is the 2nd largest opera house in Austria. The Schauspielhaus, the principal theatre for productions of plays. Dom (cathedral), a rare monument of Gothic architecture. Once, there were many frescos on the outer walls; today, only a few remain, like the Landplagenbild ("picture of plagues") painted in 1485, presumably by Thomas von Villach. The three plagues it depicts are locusts, pestilence and the invasion of the Turks, all of them striking the town in 1480. It features the oldest painted view of Graz. Mausoleum of Emperor Ferdinand II next to the cathedral, the most important building of Mannerism in Graz. It includes both the grave where Ferdinand II and his wife are buried, and a church dedicated to St Catherine of Alexandria. Burg (castle complex), with Gothic double staircase, built between 1438 and 1453 by Emperor Frederick III because the old castle on the Schlossberg was too small and uncomfortable. The Burg remained the residence of the Inner Austrian Court until 1619. Today, it serves as residence of the government of Styria. Gemaltes Haus ("painted house"), in Herrengasse 3. It is completely covered with frescos (painted in 1742 by Johann Mayer). Kunsthaus (museum of modern art). Murinsel, an artificial island in the Mur. Buildings, courtyards (e. g. Early Renaissance courtyard of the Former House of Teutonic Knights in Sporgasse 22) and roofscape of the old town. Schloss Eggenberg a Baroque palace on the western edge of Graz with State rooms and museum. In 2010 it was added to the existing World Heritage site of the historic centre of Graz. Basilika Mariatrost a late Baroque church, on the eastern edge of Graz. The Herz Jesu Kirche is the largest church in Graz with the third highest spire in Austria, built in Gothic Revival style. Calvary Hill in the Gösting area of Graz with a 17th-century calvary and church. The LKH-Universitätsklinikum, is the largest hospital in Graz and one of the largest hospitals in Austria. It is the largest Jugendstil building complex in Austria and was built between 1904 and 1912. It is run by the state and one of the most renowned hospitals in Austria and Central Europe. Best viewpoints for vistas of the city are Ruine Gösting, hilltop castle ruins on northwestern edge of city, and Plabutsch/Fürstenstand, behind Schloss Eggenberg with a hilltop restaurant and viewing tower. Österreichisches Freilichtmuseum Stübing, an open-air museum containing old farmhouses/farm buildings from all over Austria reassembled in historic setting. Lurgrotte, the most extensive cave system in Austria. Lipizzanergestüt Piber, Lipizzaner stud at Piber where the famous horses are bred. The Steirische Weinstraße is a wine-growing region south of Graz, also known as the "Styrian Tuscany". Thermenregion, spa region east of Graz. During 2003 Graz held the title of "European Capital of Culture" and was one of the UNESCO "Cities of Design" in 2011. Schloss Eggenberg with Alte Galerie (paintings and sculptures from the Romanesque to the end of the Baroque period), Coin Collection, Lapidarium (Roman stonework collection),Archeological Museum (featuring the Cult Wagon of Strettweg) a special exhibitions area and the 90,000 m2 romantic landscape gardens. Museum im Palais: museum of Styrian cultural history from the Middle Ages to the present. Neue Galerie: visual arts from the 19th and 20th centuries. Natural History Museum: exhibition of botany, mineralogy and zoology. Kunsthaus: exhibition hall of contemporary art. Forum Stadtpark: museum of contemporary art. Camera Austria: museum of contemporary photography. Landeszeughaus: medieval armory comprising 32,000 pieces of armour and weaponry, largest of its kind in the world. 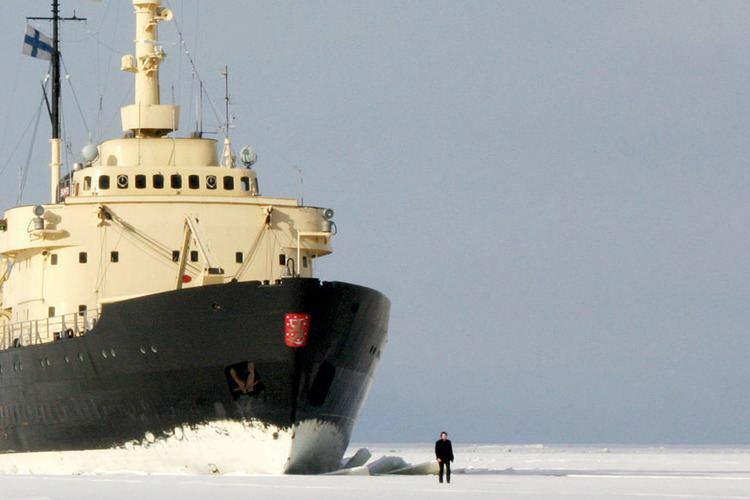 Volkskundemuseum: museum of folk culture and lore. Diözesanmuseum: museum of the Roman Catholic Church. Künstlerhaus: exhibition hall of contemporary visual arts. Literaturhaus: museum of contemporary German literature. Museum der Wahrnehmung: museum of the senses, samadhi bath. Kindermuseum Frida&Fred: museum for children. Tramway Museum: 40 historic trams, the oldest dating from 1873. Luftfahrtmuseum: (Graz airport) aviation museum. Hanns Schell Collection: key and lock museum, largest of its kind in the world. Austrian Sculpture Park: seven hectares of contemporary sculpture. Botanical Garden of Graz: three architecturally interesting glass houses plus gardens. The Old Town and the adjacent districts are characterized by the historic residential buildings and churches found there. In the outer districts buildings are predominantly of the architectural styles from the second half of the 20th century. In 1965 the Grazer Schule (School of Graz) was founded. Several buildings around the universities are of this style, for example the green houses by Volker Giencke and the RESOWI center by Günther Domenig. Before Graz became the European Capital of Culture in 2003, several new projects were realized, such as the Stadthalle, the Kindermuseum (museum for children), the Helmut-List-Halle, the Kunsthaus and the Murinsel. Buildings that will be at least 50m high currently (2017) under construction: the eco-friendly "Science Tower", this 60m tall office building will house various local green technology companies when completed and will be a zero-energy building. SK Sturm Graz is the main football club of the city, with three Austrian championships and five runner-up seasons. The Grazer AK also won an Austrian championship, but went into administration in 2007 and was excluded from the professional league system. In ice hockey, the ATSE Graz was the Austrian Hockey League champion in 1975 and 1978. The EC Graz was runner-up in 1991-92, 1992–93 and 1993-94. The Graz 99ers plays in first division since 2000. UBSC Raiffeisen Graz plays in the Austrian Basketball League. An extensive public transport network makes Graz an easy city to navigate without a car. The city has a comprehensive bus network, complementing the Graz tram network consisting of eight lines. Four lines pass through the new underground tramstop at the main railway station (Hauptbahnhof) and on to the old town before branching out. Furthermore, there are seven night-time bus routes, although these run only at weekends and on evenings preceding public holidays. The Schlossbergbahn, a funicular railway, and the Schlossberg lift, a vertical lift, link the city centre to the Schlossberg. From the main railway station (Graz Hauptbahnhof), regional trains link to most of Styria. Direct trains also run to most major cities nearby including Vienna, Salzburg, Innsbruck, Maribor and Ljubljana in Slovenia, Zagreb in Croatia, Budapest in Hungary, Prague and Brno in the Czech Republic, Zürich in Switzerland, as well as Munich, Stuttgart, Heidelberg, and Frankfurt in Germany. Trains for Vienna leave every hour. In recent years many railway stations within the city limits and in the suburbs have been rebuilt or modernised and are now part of the "S-Bahn Graz", a commuter train service connecting the city with its suburban area and towns nearby. Graz Airport is located about 10 km (6 mi) south of the city centre and is accessible by bus, railway, and car. Direct destinations include Amsterdam, Birmingham, Düsseldorf, Frankfurt, Munich, Stuttgart, Istanbul, Zürich and Vienna. 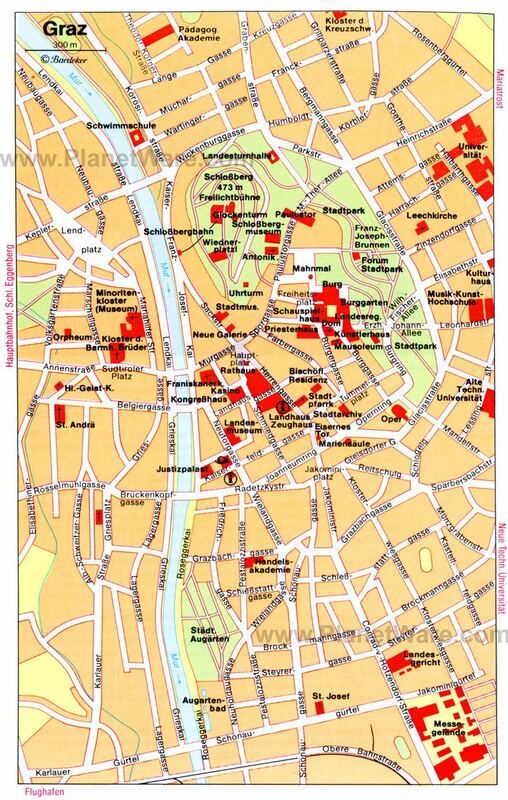 In Graz there are seven hospitals, several private hospitals and sanatoriums, as well as 44 pharmacies. The LKH-Universitätsklinikum Graz is one of the hospitals that can provide maximum care, with 1556 beds and 7190 employees. It covers the east of the city. In the west of the city there is the LKH Graz-West in Eggenberg with 280 beds and about 500 employees, the Landesnervenklinik Sigmund Freud (LSF) in Straßgang with 880 beds and 1,100 employees, as well as the Unfallkrankenhaus der AUVA in Eggenberg with 180 beds and a total of 444 employees. Furthermore, there is the geriatric hospital Albert-Schweitzer-Klinik in the west of the city with 304 beds, the Krankenhaus der Barmherzigen Brüder I in Lend with 225 beds, the Krankenhaus der Barmherzigen Brüder II in Eggenberg with 260 beds and the Krankenhaus der Elisabethinen in Gries with 182 beds. There are several private clinics as well: the Privatklinik Kastanienhof, the Privatklinik Leech, the Privatklinik der Kreuzschwestern, the Sanatorium St. Leonhard, the Sanatorium Hansa and the Privatklinik Graz-Ragnitz. EMS in Graz is provided solely by the Austrian Red Cross. Perpetually two emergency doctor's cars (NEF – Notarzteinsatzfahrzeug), two NAWs (Notarztwagen – ambulances staffed with a doctor in addition to regular personnel) and about 30 RTWs (Rettungswagen – regular ambulances) are on standby. Furthermore, several non-emergency ambulances (KTW – Krankentransportwagen) and a Mobile Intensive Care Unit (MICU) are operated by the Red Cross in order to organise transportation of non-emergency patients to and between hospitals. In addition to the Red Cross the Arbeiter-Samariter-Bund Österreichs (Labor-Samaritan-Alliance), the Malteser Hospitaldienst Austria (the Austrian organisation of the Order of Malta Ambulance Corps) and the Grünes Kreuz (Green Cross) operate various non-emergency ambulances (KTW) for non-emergency patient transportation. In addition to the land-ambulances there's also the C12 air ambulance helicopter stationed at Graz airport, which is also staffed with an emergency doctor in addition to regular personnel. The following are past and present notable residents of Graz.